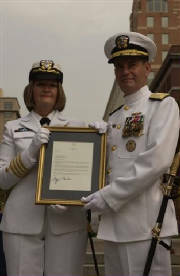 Almost 32 years ago I enlisted in the Navy--and wondered if signing away four years of my life was the right decision. But by the time I graduated from boot camp, I knew I'd be a lifer. 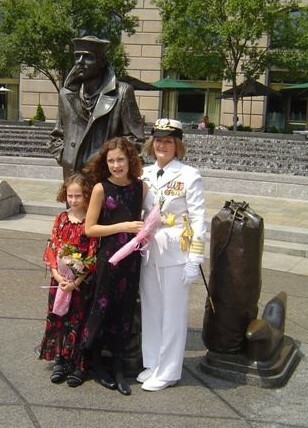 At my sister's Navy retirement ceremony in 1991, she said she'd always have a Navy contact because Diane would be in the Navy forever. Well, Kayo, forever has arrived. 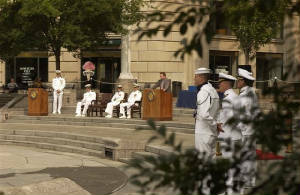 I welcome all of you to today's ceremony here at the Navy Memorial in downtown Washington DC. I'm honored you took the time to attend, and I'm especially honored by the presence of one of my leadership heroes, James Webb. Thank you, Mr. Webb, for agreeing to speak today. Thank you, Admiral Church, for hosting the ceremony, and welcome to Ms. Loftus. Chaplain Gary Clore and I were stationed together in Japan six years ago. 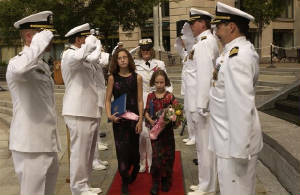 When I started planning this ceremony, and learned he had orders to the Naval Academy, I called to ask if he'd be arriving from San Diego in time to participate. Thank you, Gary, for fitting me into your schedule. I dedicate this ceremony to the memory of my younger brother, Kenneth Diekman, who died one year ago today of an aneurysm. He had been a second lieutenant in the South Dakota Army National Guard until hepatitis destroyed his health. This is where I planned to say how happy I am that my little brother, Sergeant Ronald Diekman, came from Iraq for my retirement. His South Dakota National Guard unit has been deployed to Iraq since January. On Sunday morning Ron began his journey home. After hours of bus travel and waiting, his flight left the Kuwaiti airport Monday evening on the way to Dallas. But the plane immediately returned to the airport because the landing gear wouldn't retract. So Ron waited another day and I'm not sure where he is right now. Our family has Army men and Navy women. Dad was in the Army during World War Two. 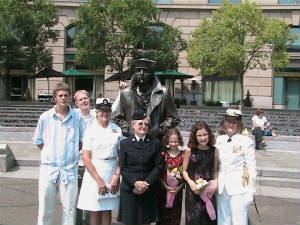 Mom was a World War Two WAVE, and my sister, Kayo (Lorraine Paver), is a retired Navy senior chief. Don't they look great in their uniforms? Kayo's sons, Casey and Kellen, are here today. And you've already met my daughters, Amanda and April. My older brother, Keith, is home on the farm in South Dakota, and we lost Dad to Alzheimer's disease last September. That's my family. In 1991 I was a department head at Naval Air Station Jacksonville. I'd volunteered to organize the annual POW/MIA ceremony and needed a guest speaker. One day at a Moving Wall display, I saw someone who looked like a possible candidate, and I introduced myself. Carl Creamer had been a prisoner of the Japanese during World War Two, and he agreed to speak at the ceremony. We've been friends ever since. Carl and his son Roger, both retired Navy chiefs, drove from Florida for today's ceremony. To encourage my sailors in Jacksonville to exercise, I invited them to run with me on Tuesday mornings. Rick Robison, now a retired senior chief, ran the six miles with me more frequently than anyone else. He and his wife, Kim, are here from Pennsylvania today. 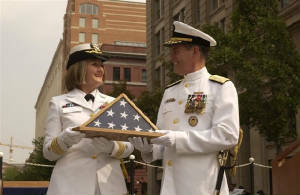 The Navy friend I've known longer than anyone else is retired Captain John Paron. We were classmates in aircraft maintenance officer school in 1978 and stayed in touch over the years. He's one of the first who encouraged me to become a writer. Welcome, John and Carolyn. I'd like to welcome all my coworkers from the Naval Inspector General staff, my fellow maintenance officers, former shipmates, and the people from our church and school. Debbie and France Moeller were my neighbors when I lived on the other side of town--in Springfield, Virginia. John Hauser helped me find my current house in Upper Marlboro, built in 1897 by the grandfather of Reg and Marge Traband, who are also here today. I enlisted in the Navy instead of starting with a commission because the women's officer program had no openings in 1972. One of my proudest moments was graduating from basic training with three green stripes on my sleeve, in contrast to the one black stripe my classmates wore. The green denoted aviation, and my college degree qualified me for the E-3 pay grade. To commemorate that occasion, Airman Stables is serving as one of my sideboys. The other sideboys are Navy IG coworkers and fellow AMDOs, and I thank you for being with me today. My sister Kayo and I both chose aviation ratings, as had our mother before us. Those two worked with aircraft logbooks, and I became an aviation storekeeper--an AK. My goal when I joined the Navy was to make second class petty officer in two years. And I succeeded--Kayo and I both made second class off the same advancement exam. But by then I had already been selected for officer candidate school. When I was commissioned in May 1975, my base pay doubled--from $500 to $1000 a month. It didn't take long to get used to the extra money. The first thing I did was buy my first new car--a red 1975 Pontiac LeMans. My initial duty assignment as an officer was at a joint service organization, with Army LTC Langley Chavis in command. I'm going to send him a copy of this speech so he knows how important a role he played in making me a leader. As an ensign, I had numerous collateral duties and I did them willingly--except for the job of race relations officer, which included giving quarterly training sessions to the command. The idea of speaking to a roomful of people terrified me, and I let my sergeants conduct the sessions. I told myself it was good experience for them. Then one day LTC Chavis's secretary handed me a sealed envelope. The letter inside began with glowing comments about my performance, before going on to say I was failing in one area. I was shirking my responsibility as race relations officer by pushing the job onto my subordinates. LTC Chavis expected me to prepare and present the next session by myself, and he would record the outcome in my fitness report. That experience taught me two valuable lessons. Being forced into public speaking made me realize I could do it, after all. I also learned how to counsel and discipline subordinates. I've used LTC Chavis's technique many times throughout my career, starting with that same command. I gave an Army staff sergeant a letter that explained what he was doing right, what he was doing wrong, what he needed to do to improve, and a deadline. He could either succeed or be fired. Not everyone is cut out to be a supervisor, and his office ran more smoothly after I demoted him. I wanted to help all my subordinates do a better job. That ranged from correcting them to getting rid of their non-performing coworkers. I always gave a warning and a chance to improve. Once I suggested to a boss that he express his dissatisfaction with a certain lieutenant. My boss said, "He'll know I'm dissatisfied when I call him in and fire him." That isn't my style of leadership. Every now and then I receive an e-mail that begins, "You probably don't remember me, but...." The writer goes on to explain when we worked together and how I helped that person's career or set a positive example. There's no greater reward than comments such as that. Over the years I've heard people say, "the Navy made me drink," or "the Navy made me a smoker," or "the Navy made me cuss." I say, what the Navy made me was a speaker, a writer, and a leader. My final assignment at the Navy IG is a special study on commanding officers. Having been a student of leadership for 30 years, I can't think of a better way to wrap up my Navy career than offering recommendations to improve command leadership. Retirement speeches are supposed to contain advice, so I'll summarize my leadership philosophy in three words: example, integrity, dependability. Leaders, like parents, are always role models. They have the choice of being good role models or poor ones, but they can't get away from being examples to follow. Integrity cannot be compromised. I know of two captains who pressured their subordinates to lie for them or suffer career damage. In the first case, the subordinates acquiesced. When the captain got fired and punished, guess who went with him? In the second case, the subordinate refused to lie for his boss. The captain got fired, but the person with integrity continued his upward career path. I know many people who keep their word, but my two favorite examples of dependability are Jim Webb and Ron Diekman. When they say "maybe," it's almost a yes. Those two stand out as people who follow through on their commitments. That's enough lecturing. Let me tell you the two things I disliked about the Navy--urinalysis screens and physical readiness tests (PRTs). I looked forward to turning 25 because--back then--only those under 25 were monitored for drug use. The year I turned 25, the Navy changed the rules and removed the age limit for urinalyses. I looked forward to turning 50 because the PRT was optional for those over 50. I planned to end with my record of 22 consecutive outstanding PRT scores and never take the test again. The year I turned 50, the Navy changed the rules and removed the age limit for the PRT. Whatever my age, I'll maintain a young attitude. I believe in staying physically fit, keeping a positive outlook on life, and looking to the future instead of the past. At age 40 I ran my first 40-mile ultramarathon. That was before I'd run any 26-mile marathons. At age 50, I became a mother when April and Amanda dropped into my life and I adopted them. Who knows what will happen when I'm 60? Maybe I'll get married. For the time being, I plan to finish writing the biography of country music singer Faron Young, and then I want to start a series of nonfiction books on special operations warriors, written for teenage boys. I don't know whether we'll stay in Upper Marlboro or whether we'll decide next summer to take advantage of that last Navy move. After all, I'm used to finding a new home every three years. You'll see me around the office the next two weeks, writing the report for our special study. Before closing, I want to acknowledge LCDR Vera Parker, who served as coordinator for this ceremony. She put several months of effort into getting ready for today. Our color guard is from the Dahlgren Division of the Sea Cadet Corps at the Washington Navy Yard. Thanks also to CAPT Chuck Key, the master of ceremonies, to Petty Officer Ramone Jefferson for his assistance, to Petty Officer Sullivan for the National Anthem, and to the ushers and other participants. A special thanks to Ezell and the Navy Memorial for the arrangements and the use of this superb facility. I will now read my orders.